You know, the thought never even occurred to me that artists would want to send me their stuff when I started writing this thing. Twice now this has happened, coincidentally both times it has been our friends to the south. New York City is where Julia Barry calls home, and the smooth sounds of her jazz should be heard from coast to coast. I'm fairly new to jazz, only really started to listen to it in the past year. It's an album like this that is getting me totally hooked. 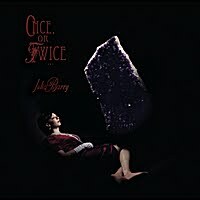 Once, or Twice is Barrys' 2nd album, and is a beautiful listen. It's a little slower than the jazz I started listening to, but it's the strength of Julia's voice that really pulls you through each song. I remember growing up thinking how lame it was that my mother would just lie on the couch and listen to music. There were a few years of denial, but now I do the exact same thing. This record is the perfect vibe for that. Whether it be staying in from the rain, or basking in the sun and relaxing on the patio. One of my favourite qualities of jazz is it seems to invoke creativity and thought. It has an inspiring quality, and this disc is no different track 1-11. Barry does a great job of story-telling, accompanied often by brilliant piano and an array of other instruments. I felt like just listening has brought my creativity to the surface, even this review has been very easy to write! If you are a fan of jazz, I am confident you will really enjoy this album. If you are interested in jazz, then I strongly suggest listening to Once, or Twice as Julia does not short the listener on this one at all. A gift from the "City That Never Sleeps" to Island SoapBox, and now in spirit of green living, a re-gift to all you lovely people. Listen to music here: here.